In his final start of August, Cliff Lee went 8 and 2/3 innings without allowing a run. Lee plunked Miguel Cairo with pitch number 117, cuing Ryan Madson to get the game’s final out. Last night against the Atlanta Braves, Lee finished where he started, using only 100 pitches en route to his 200th strikeout and 6th complete game and 6th shutout of the season. Lee is now at 106 batters faced without allowing a run — 29 and 2/3 straight scoreless innings across 4 starts. Wow. Despite striking out an uncharacteristically low number of batters (6), Lee instead trolled the Braves hitters by inducing 14 ground balls (second only to his present season high of 17 in his complete game against the Cardinals) and allowing nary a walk. Last night’s shutout makes complete game number 6 for ol’ Cliff Lee, pushing his statistics down to: 2.47 ERA, 2.64 FIP, 2.76 xFIP, and a 2.67 SIERA. When it comes to the 2011 NL Cy Young race, it presently comes down to just three fellas: Cliff Lee, Roy Halladay, and Clayton Kershaw. Yes, one could make the case for the likes of Madison Bumgarner, Matt Cain, Cole Hamels, and even Daniel Hudson and Matt Garza, but the Big Three are presently sporting Cy Young statistics, residing on a plateau of their own Manly Awesomeness. Of course, anything can and will happen over the last few weeks, and a few crazy-good games could make this Cy Young race even closer, but for now, I imagine the voters are most closely watching these gents. And frankly, among these twirlers, Doc Halladay stands the strongest. Not only does he lead the league in FIP (2.12), xFIP (2.61), tERA (2.39), and SIERA (2.54)*, but he has been the league’s most consistent starter. 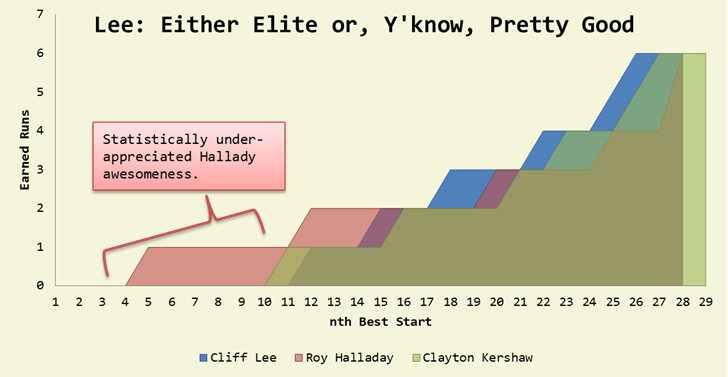 How has Halladay, with not but even one shutout, been more consistent than Cliff Lee? Well, first of all, every one of his meaningful statistics have been lower. 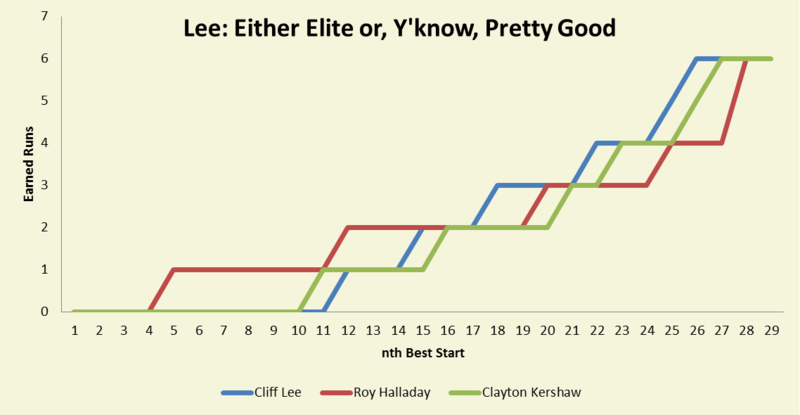 As we noted above, Lee is second and third in the league in all categories except shutouts, while Halladay and Kershaw typically fill the first and second position respectively. Add to that truth bomb the fact that Roy Halladay has the lowest variability in ERA and FIP among the Top Three. Whereas Lee’s FIP has a standard deviation of 1.78 and his ERA a 2.07 standard deviation, Halladay stays cool with a 1.69 FIP standard deviation and a crazy 1.41 ERA st. dev. Kershaw owns an impressive FIP 1.70 st. dev. and 1.999 ERA st. dev., but like everything else, he’s just woefully second to Halladay. Looking at earned runs over the season, we can see how Halladay has been sneakily good (assuming there’s anything sneaky about utterly dominating a whole league) — Doc has managed to pitch super deep into games, but because he’s allowed just 1 or 2 runs, he’s missed any and all shutout chances. In real terms, this is more valuable. Yeah, Lee pitching 6 shutouts guarantees a win in each of those games, but the Phillies won 9 to 0 last night. It’s more valuable across the season to have consistently fewer runs than being somewhat of a binge elite pitcher like Lee (which, in truth, may exaggerate his ability when he’s “off”; he’s only allowed 4 or more runs 7 times this year; Halladay, by contrast though, has only been tagged for such numbers 4 times). 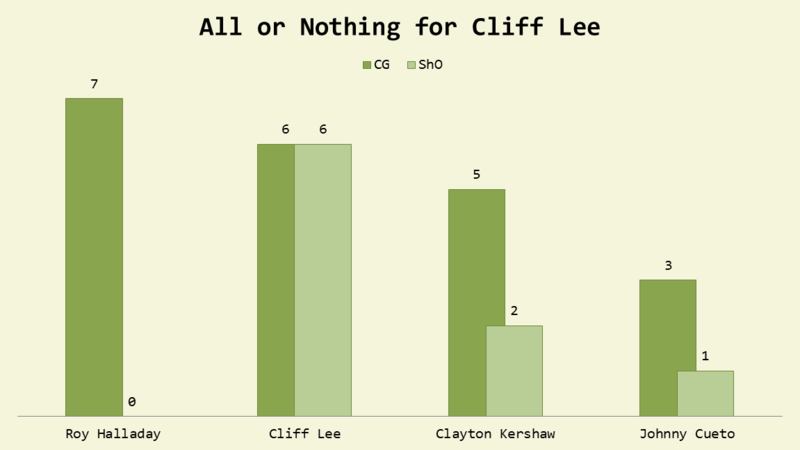 Lee has continued to impress in 2011, but there’s no surprises in the NL Cy Young race: The Doc has it if he wants it. We hoped you liked reading Cliff Lee: Complete Games, Shutouts, And Cy Youngs by Bradley Woodrum! Two grammar/spelling errors in the -first paragraph-, “We can illustrate this distinct like so:” and “exagerate” in the second-to-last paragraph. I wasn’t even trying….sorry to now be one of those guys, but it seems to just get worse with every article. yea, you should of used a spell checker. I hope this was sarcasm. Please tell me it was sarcasm.